For such a tiny island country, Malta is without a doubt one of the most interesting places in the world. Its location in the middle of the Mediterranean Sea has made it accessible to many different groups of people. 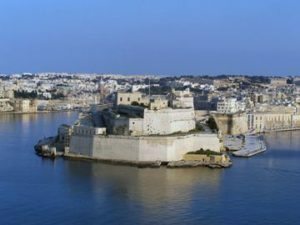 Pottery found here by archeologists suggests that the Maltese Islands were first settled in 5200 BC mainly by Stone Age hunters or farmers who had arrived from the larger island of Sicily. About 3500 BC, these people built some of the oldest existing, free-standing structures in the world in the form of huge megalithic temples – seven of them inscribed as UNESCO World Heritage sites. They also created the Hypogeum, a unique necropolis and temple carved three-stories deep underground. And the Greeks, Phoenicians, Romans, Byzantine and Arabs all marched through these tiny islands, leaving behind evidence of their stays. The Knights of the Hospital of St. John, a military religious order also known as the Knights of Malta, had been driven out of Rhodes by the Ottoman Empire in 1522, and in 1530 Charles I of Spain gave them Malta to be their new home. 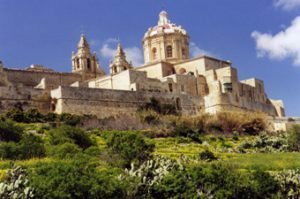 Under the rule of the Knights, often referred to as the Golden Age for Malta, Renaissance and Baroque architecture was introduced in Maltese towns and villages which is still evident in many places, most notably the capital city Valletta and the Valletta Grand Harbor. They also laid the foundation of the present-day University of Malta, which as a result is one of the oldest extant universities in Europe. Many of Malta’s most attractive buildings were built during this period. The buildings of Valletta, its fortifications and the art treasures in its museums, magnificent palaces, and churches, are the work of the best European engineers and artists of the time. The fortification of Valletta was begun in 1566, soon becoming the home port of one of the Mediterranean’s most powerful navies. The island’s hospitals were expanded as well. The main hospital could accommodate 500 patients and was renowned as one of the finest in the world. Valletta itself became a center of art and culture and the impressive architecture still stands as testament to the power of the Knights. In the magnificent Co-Cathedral of St. John the Baptist, completed in 1577, superb paintings by Caravaggio still hang on the walls. Displayed within the opulent Grand Masters Palace, built to house the government under the Knights, are priceless tapestries, elaborately painted ceilings, intricate frescoes, and other exquisite works of art. Travel on Far Horizons’ tour to Cyprus and Malta and experience these two historically rich islands of the Mediterranean!